Marketing automation has been a hot topic in recent years, and with the deployment of new, less expensive and more accessible solutions, SMEs can now take control of techniques previously reserved for large groups. But besides being a fabulous time and energy saving opportunity, marketing automation is also a way to spawn more leads and move your small business to the next level. In 2015, Insight estimated that 80% of the users of automation solutions had seen their amount of leads increase and that an increase of 417% of the average revenue had been recorded for the companies having implanted this type of marketing. No doubt this type of practice can be beneficial for any business. There are, however, varying ways to implement automated marketing actions, but here are some ideas that will put you in the infernal machine. The term "marketing automation", also called "automated marketing", is a set of techniques and tools that enable a company to automate certain marketing actions and marketing campaigns throughout the task of prospecting, lead generation on the web and sales. The Principle is Simple: make the most of the traffic generated by the various web supports to maximize their efficiency, by setting up automated mailings or other lead nurturing techniques, and also automatic statistical follow-ups. Concretely, marketing automation supports sales forces by providing new prospecting opportunities, but also by optimizing the resources of existing customers to generate more sales. It makes it possible to reach the prospects in a more precise way and especially at the right moment of their reflection, and consequently to provoke a commitment faster than if one had a "manual" approach of things. One of the main logic, why SMEs are reluctant to implement automation strategies, is a lack of financial resources to implement the various IT tools needed for the effortless orchestration of operations. However, some relatively inexpensive solutions can quickly integrate some campaigns of automated emails or social networks, also statistical follow-ups. In addition, and if you aim to integrate more complex automation solutions, it is better to address a specialized and reliable partner who will put the processes in place for you to avoid errors or technical failures. The first thing we can say is that one of the goals of marketing automation is to support the sales funnel that you have designed for your site and for your web content in general. At the base of this implementation, it will be necessary at first to imagine a way to retrieve contact details to build a qualified database. This can be done by setting up a newsletter registration form, or providing downloadable content such as a white paper, or downloading your mobile application to retrieve certain information from your target audience, and of course their emails. Sending an email to your new subscribers is typically a case where marketing automation can help: instead of generating your welcome emails manually, you will be able to create an automated email that will be sent automatically after each registration or download to validate the registration of the prospect and communicate the benefits that it will have to be part of your community. As a result of this registration, do not hesitate to automate a series of emails every few days to support the prospect and bring him relevant information for him. This can be for example an aid to the purchase or the use of your mobile application. The goal here is not to lose contact with the person, and it is precisely this automation that will be able to meet his needs quickly and efficiently. Nothing prevents you to go further in automating your marketing to reach your prospects at all stages of their commitment to your business. To do this, you will need to segment your database in a relevant way: it is now possible to automate its segmentation in an evolutionary way according to the evolution of the relationship of the consumer with your company. This dynamic segmentation will make it possible to adapt the actions so that the client goes to the next level in his commitment. Lead scoring will allow you to spot where the prospect is in your sales funnel; this consists of assigning a score based on different criteria based on the demographic or behavioral data in relation to your content that characterizes the lead. For example, a prospect who has opened your last email campaign or viewed your last blog post is a qualified prospect who will likely be converted to a client quickly. It's up to you to spot these different opportunities and create automated campaigns based on your own sales channel. This principle can, for example, be adapted in the context of an abandonment of purchase: a prospect who would have abandoned the ordering process after the validation of his basket. You can automate a specific campaign for this type of prospect by sending a discount coupon or a limited offer in time. In this context, marketing automation will make it possible to convert a "lost sale", and if possible within two hours of abandonment. Do not hesitate to set up complex scenarios specific to your activity and to match DRIP campaigns to best adapt to the behavior of Internet users. DRIP campaigns are understood to mean a series of messages sent after a particular action of the prospect. This can be for example an email after an order, then a raise 6 months later to encourage the customer to recommend on the site. These automatic channels can obviously concern emails, but also other media such as messages on social networks for example. These are closely linked with the sharp monitoring of your leads through specialized software. Email marketing has evolved significantly over the years and now offers new marketing opportunities that must be taken advantage of, especially if you manage an SME that communicates essentially through this channel. Personalization is one of those opportunities because a well-designed, personalized and smartly directed e-mail campaign can easily increase your opening rates and conversions. Today, personalization goes far beyond simply specifying the recipient's name: your emails can deliver personalized content in real time. You will be able to integrate the content of your target's residence, the opening time and even the type of device used by your target to read your email. This is all the more important as the content of your emails can adapt responsively to the user's screen. The customization goes even further: it is also possible to offer products to users based on their browsing history or purchases, making the content of your messages even more relevant and dynamic. All this is of course aimed at getting the prospect's attention and creating a commitment and a purchase even more quickly. Another way to implement marketing automation is to develop communication around specific events you want to promote. A very good example would be to create a succession of emails to communicate on a webinar or any other event that you want to set up. We can imagine in this context, a first email to encourage registration, then a reminder a few days later for prospects who have not yet registered, even an offer for those who have expressed an interest in your content without going through the registration process. We will have the same logic for the promotion of an eBook, the communication of a special sale or participation in a trade show. This practice can also be adapted to the commercial relationship: for example, by offering some "hot" prospects a date of appointment to make the link with the sales force. Combining your campaigns with your own CRM tool can also be a great idea for automating customer follow-ups. Why not give your loyal customers the benefit of automated referral systems? Rewarding its customers helps to increase the rate of re-purchase and the phenomenon of word of mouth. Automated communication with discount coupons can also prevent your loyal customers from going too quickly to competition. Some companies even send e-mails to wish their customers a birthday. This is indeed the perfect time to send a personalized email with a special offer on this occasion. This type of campaign generally has conversion rates much higher than a traditional email campaign by its exceptional nature and limited in time. Marketing automation is not just about email campaigns, it can also be used to manage your presence on social networks. In this case, automation will help you provide consistent visibility and consistency across selected networks. Thanks to some tools like Socially Map or Buffer, you will be able to plan for a certain chosen period of your publications, while applying yourself to stay natural to avoid any "robotic" effect on your publications, and always make sure to offer interesting content and qualitative. The automation of your publications on these networks will allow you to save a lot of time, but especially to have a strategic reflection of the content that you broadcast. Now we have discussed market automation, let us dive in really into email marketing. Mailing is still today one of the most powerful marketing levers known. But even though it doesn't start from yesterday, it is the way to use it that has greatly changed. It is no longer a matter of painstakingly compiling a shipment per year to its entire database, but of setting up scenarios to automate the sending of targeted emails in a contextualized way. Discover all the issues related to the use of emailing in our dedicated section. 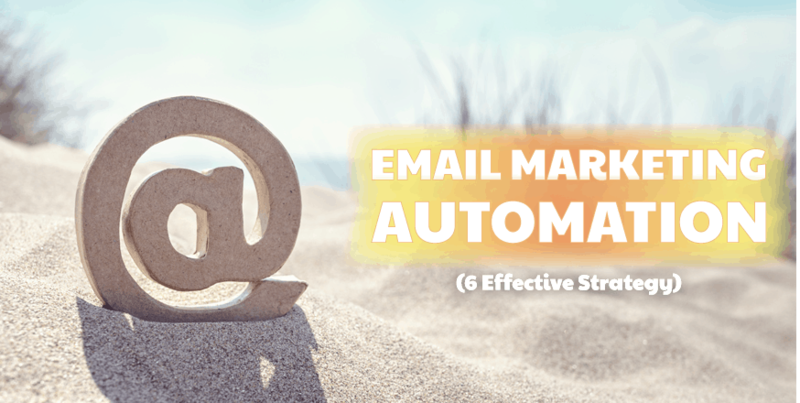 Unlike traditional mailings, the automated email campaign can be programmed upstream and once. It lasts the time you want. The software will ship it whenever a parameterized case occurs. You think about your scenarios and write type emails once and for all. They will be able to broadcast without you having to worry about it. Rather simple? Yes. Now concretely how to develop your scenarios? No ideas? Here are some to inspire you. Align the navigation on your site for the user to create an account, or subscribe to your newsletter. Then schedule the sending of a welcome email. A warm and individualized way to make contact while testifying to your attention. On the occasion of this first email, why not slip a special offer or a promotional code? The person has shown interest, give him the boost that will make him decide to consume. Bridging the supply over time can enhance the incentive of your proposal. In some areas, prospects will tend to buy if they could test. They will be reassured, convinced. And once you have opened an account, they will be likely to stay home. Do you know the birthday of your customers? Give them a gift! A common practice and always welcome. For an Event for Example: It is crucial to promote events to ensure that participants come. Hence the need to send. Save the date and reminders upstream. In Domains with Recurrence, as in Health for Checks up for Example: Schedule an email to send each year to your patients for example. A beneficial action for you as for them: playing the role of reminder you make it easier for them and take their follow-up to heart. For Subscription Logic: Your customers are used to benefit from your services. But the subscription will expire. It's also your role to remind them earlier so they know it in time. In your business strategy, email automation is a support to maintain a strong link with your customers. Loyalty is not innate, we must give news, take it. By scheduling the sending of an email to all those not contacted for x weeks, you make sure not to leave anyone. Your customers will be happy to hear from you, they will be more than happy to return. Brand consideration, this email may take the form of a survey or an evaluation. A great way for you to understand their expectations, to better meet them. So-and-so was not until the end of the purchase. So- and- so has selected such and such products in his wishlist. So- and- so has bought such a product but no such accessory. Offer a discount on an item of the wishlist. Offer a complementary product to the one purchased. So, inspired? Do you see any application cases to adapt? Very good: Now concretely how to proceed? Collect Emails: via a web form or registration pop-up, to associate with your site, blog, or a landing page. Create Campaigns: a drag and drop feature ensures you create newsletters, mailings, landing pages, and even polls. Some templates elegant and responsive make your content compatible and attractive with any device. Segment Targeting: a variety of attainability's should be offered to you. It would be unwise to send the same email to someone twice, especially if they read it the first time. Or the time of sending the mailing. Expand the Means of Action: the SMS can display much better rates, for information calling for answers or quick reaction, or invitations. Some email automating software declines cross-channel to make the most of the different channels. Automate: You can fashion your automation scenario directly in the platform as you have created your campaign - drag and drop - to better automate your customer journey by adjusting it to the timing and behavior of each. Thus each email or email cycles will be more precise, better targeted and therefore more effective. Program: With the predictive sending system, the software should be able to use big data to automatically send each of your contacts your email at the most optimal time. Analyze the Impact: each of your shipments displays statistics, to evaluate their performance, it is necessary to compare them. The tool performs this tracking draws recommendations for your next actions. For prospecting as for loyalty, an automatic email is a quick, simple and effective lever. Given its thousand possibilities, you create scenarios that reflect your image while boosting your business strategy. Great post. Great insights into marketing automation. Appreciate the point regarding the personalization for the website. It all starts with the customer engagement. Your information is presented in a clear and informative manner, primarily where you have explained with the examples. Thanks.